Although many people start riding when they are young, there are a growing number of people taking up riding later in life. Riding can be an enjoyable pastime for both young and old, but because of the unpredictability of a horse it can sometimes be dangerous. Anyone wanting to start riding should join a riding school for tuition. There are many riding schools to choose from but you should ensure that it is registered and safe to use. 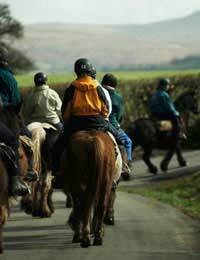 Riding schools offer various lessons, either in groups or privately on a one-to-one basis. Private lessons are more expensive than group lessons, but you will learn more quickly than in a group. Most riding schools will not teach beginners in groups but only offer private lessons. It's a good idea to visit the school before joining, so you can see for yourself how the lessons are carried out. Some schools offer indoor and outdoor riding facilities, while others may only offer one or the other. Outdoor schools have all weather surfaces so riding can take place all year round, so if you don't mind occasionally getting wet, then this option could be suitable for you. If you have booked lessons over the phone or without visiting the school, make sure they know your weight and height, so a suitable horse can be selected for your lesson.Horse riding uses muscles you never knew existed, so it's a good idea to only book a lesson that lasts for around half an hour. Even then you will feel stiff and sore for a couple of days until your muscles get used to it, but this is quite normal. You don't need to go out and buy a set of equestrian clothing if you are a beginner. Riding Hats are available to hire at riding schools and this is the most important item of clothing you need. A body protector can also be a good buy for a beginner as it will give protection to the back if you fall off-which is pretty likely in the beginning. Saddle - The saddle should be checked for any wear or cracking. Squeeze the sides of the saddle together to check the tree of the saddle. There should be no movement, if there is it can cause damage to the horses back. Girth - Check the girth straps are secure and the stitching isn't damaged. Check the stirrup leathers for wear and check the stirrup bars are secure. Check girth buckles to ensure they're not damaged or bent, and check the stitching around the buckle. Check the girth for any signs of wear and tear. Bridle - There should be no cracking or wear on the leather, the buckles should be secure and not bent and the stitching should be inspected to make sure it is secure. Reins - Check the reins for any wear, cracking or weakness, and make sure the bit is clean and doesn't have any rough edges which may hurt the mouth of the horse. If the saddle or tack fails any of the checks it must be replaced before you start to ride.Saddle or tack equipment failing while you are riding can cause a nasty accident. Now all you're checks have been made all you need to do is mount up and go and enjoy yourself.